A British opthamologist, Andrew Bastawrous, is piloting the Portable Eye Examination Kit (Peek) in Kenya – an optical technology aimed at reducing eye problems and avoidable blindness in low-income countries. Of the 385 million visually impaired people globally, it’s estimated that 90% live in developing countries. Effective diagnosis and follow-up of eye patients can help eliminate the avoidable cases of visual impairment which account for 80% of blindness. 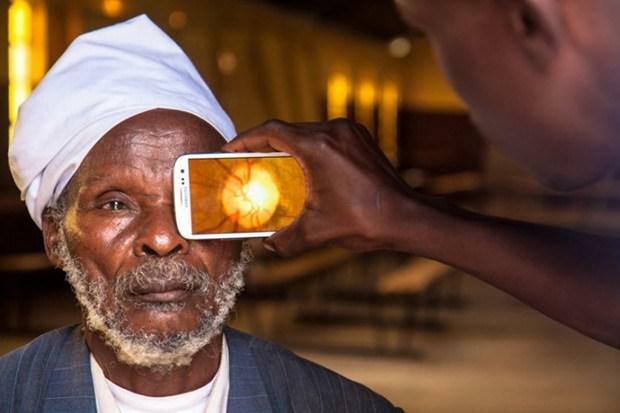 Over 2,000 people have currently been tested with Peek Pocket Optician – an Android mobile application used together with a clip-on hardware transforming low-cost smartphones into equipment for eye examination and diagnosis. The original trials were carried out in Nakuru county through 2012 with a newer design now deployed in Kitale. By the end of the pilot, 5,000 people will have been tested across the Rift Valley region. The tool has been used in outreach programs hosted in schools, community clinics and eye hospitals at no charge. Similar programs are planned for Botswana, India and Tanzania.